THE VILLAIN: Colonel Tan-Gun Moon (Will Yun Lee) - son of General Moon, educated at Oxford and Harvard, involved with illegal arms smuggling for African conflict diamonds. Sir Gustav Graves (Toby Stephens) - flamboyantly wealthy British émigré diamond baron, official bio lists him as an orphan who went from working in the diamond mines of Argentina to controlling a huge diamond mine in Iceland, a champion fencer with a supposed interest in ecological issues, developer of the Icarus space program. SUB-VILLAINS: Zao (Rick Yune) - North Korean collaborator of Colonel Moon, betrayed by Bond, and subsequently scarred with diamond shrapnel. Dr Alvarez (Simon Andreu) - leading researcher in gene therapy, runs a clinic where he purportedly helps Cuban leaders extend their life expectancy. Mister Kil (Laurence Makoare) - security officer working for Graves. Vladimir Popov (Michael Gorevoy) - technical genius behind the Icarus satellite. VILLAIN'S PLOT: Gustav Graves plans to use the Icarus satellite weapon to destroy the minefield in the Korean Demilitarised Zone, allowing for the takeover of South Korea and the uniting of Korea, Japan and China into a new, unstoppable superpower. 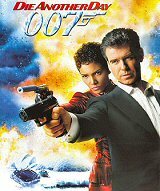 BOND WOMEN: Giacinta 'Jinx' Jordan (Halle Berry) - beautiful African-American NSA agent. Miranda Frost (Rosamund Pike) - Harvard-educated publicist for Gustav Graves, fencing gold medal winner at the Sydney Olympics, working undercover for MI6. BONDS ALLIES: General Moon (Kenneth Tsang) - North Korean General with hopes of peaceful relations between North and South Korea, father of Colonel Moon. Falco (Michael Madsen) - NSA agent who believes Bond confessed secrets to North Korean officials under torture. Mr Chang (Ho Yi) - Hong Kong hotel manager actually working for Chinese Intelligence. Raoul (Emilio Echevarria) - Cuban sleeper agent working for MI6 in Havana. Verity (Madonna) - fencing coach at Blades. Q (John Cleese) - the creator of Bond's lethal gadgets. BOND'S GADGETS: Surfboard with concealed weapons; combat knife with GPS beacon device; watch which emits laser beam cutter; Aston Martin V12 Vanquish gadget car; ultra high frequency single-digit sonic agitator ring; Switchblade personal jet glider.